You will find these all over Pinterest right now. 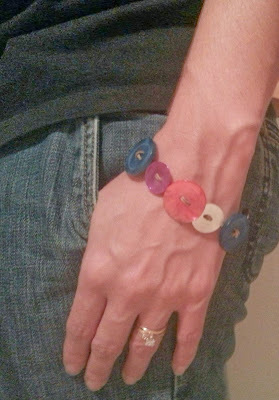 Just google "button bracelet" and you will get thousands of tutorials on how to make them. I am the creative activities coordinator for my MOPS (Mothers of Preschoolers) group this year. That means that I am in charge of planning crafts for our moms to do at various meetings. I need simple and inexpensive crafts for our 50+ moms to creative in a 20 to 25 minute time frame. This craft fit the bill perfectly! The longest part of this craft was selecting my buttons. Once I had them selected, it only took 10 to 15 minutes to make the bracelet. I read several instructions for these and tried a couple, but none of them worked for what I needed. They either involved sewing (which takes too long for my time slot), used materials that were not in my budget for this large of a group or just didn't work (ie. the bracelet ended up too small for my 6.5 inch wrist). So, what do you do when that happens? You make it up yourself! I was able to use coupons at my local craft store and plan this craft for about $10, and after 50 women make a bracelet I will have lots of left overs. Start by folding your cord in half. Tie a knot to form a loop at the folded end, this will become your "hook". Make sure that the loop is big enough to fit your button through. Before threading your buttons onto the cord, lay them out to make sure you like the pattern. Then thread them on and slide them together to your liking. Once you have them all on, wrap it around your wrist to check the length. If it is too long, take some buttons off and if it is too short, add some more buttons. Tie a square knot under the last button and trim the excess cord.